Light and casual golf shoe summer fashion! The Stylo Ladies Velcro Golf Shoes are comfortably padded and styled with a relaxed approach to the game, quickly fastening with a Velcro strap and offering breathable and waterproof protection while supporting your feet from underneath with soft cushioning and an EVA Outsole fitted with green friendly Cross Spikes for stability, traction and power in your golf swing. 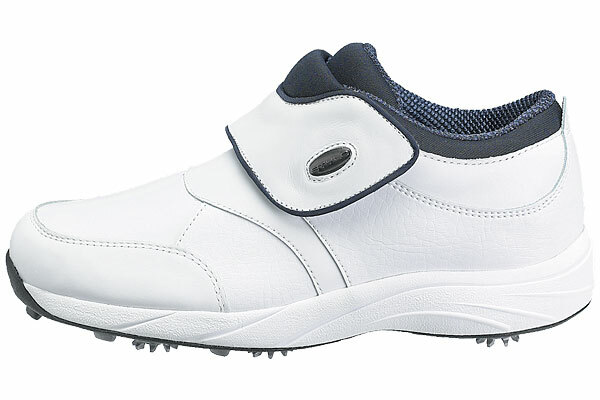 Perfect for any casual lady golfer enjoying the game this summer, Stylo Ladies Velcro Golf Shoes are available in a range of sizes from 3 to 8 in white. Made for comfort with its Velcro fastening and added padding, Stylo Ladies Velcro Golf Shoes are casually styled and incredibly comfort while their breathable leather uppers and Iso-thermal waterproof membrane gives excellent all round moisture protection from both within and without, making them ideal for the hot summer month, especially for any unexpected downpours. Casually styled for comfort, these lightweight Stylo Ladies Velcro Golf Shoes also offer excellent underfoot support, surrounding the foot in a foam heel freelonic insole and cushion lining while a EVA outsole with TPU arch supports and green friendly cross spikes provides stability, traction and added power to your swing. Tuotteen lisäyspäivä: tiistaina 26 elokuuta 2008.